First of all, yes, I actually read books like “Europe’s high points” for pleasure. 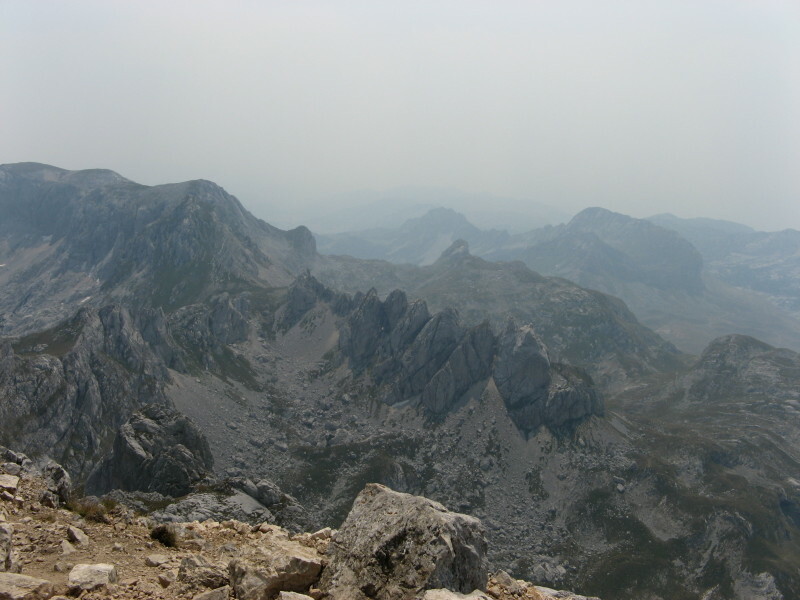 Briefly, its “A guide to reaching the summit of every country in Europe – driving, walking and climbing routes to the tops of 50 countries in Europe”. I’ve been to some of these high points, and am a hiker and mountaineer experienced enough to enjoy reading descriptions of routes to peaks. Its a bit like I’m hiking there myself, but while laying home on my couch. I find reading passages like “Cross the stream and follow a pleasant shady path through the forest” (Bobotov Kuk, Montenegro) rather soothing. Of course, the book has other qualities beyond the soothing effect – it contains great photos, some interesting background information, and can actually be used as a guide for some of the easier high points. Plus, I intend to use it as an inspiration in choosing travel destinations. This book is more controversial than you may think. The exact height of some points is debated, borders are disputed and new countries keep emerging. The section in “Europe’s high points” I find most most curious is the one in which the authors make an attempt to resolve “what is Europe”? It is much the same question I’ve had when I started this blog and defined Europe as all those countries that are a member of UEFA (a definition mentioned in the book). The definition of Europe offered by the authors of “Europe’s high points” roughly coincides with mine. But our definitions vary in some points and these are of course the differences that are most interesting. “Europe’s high points” excludes Israel and the Caucasus countries of Georgia, Armenia and Azerbaijan from their definition of Europe on geographical grounds. This argument is a rather peculiar one. Cyprus and Malta are also not “Europe” geographically, Cyprus lying on the Asian plate and Malta on the African one. But Cyprus is included citing cultural arguments and Malta’s geographical belonging is not discussed at all. Iceland’s inclusion can be disputed as well, as Iceland is nowhere near the continent of Europe and is as European as the Azores, for example (see below) Parts of Georgia and Azerbaijan are inside Europe’s geographical definition, being North of the Caucasus watershed, so it would be reasonable to at least include the high points of those areas, like the authors have done for Turkey. Speaking of Turkey! 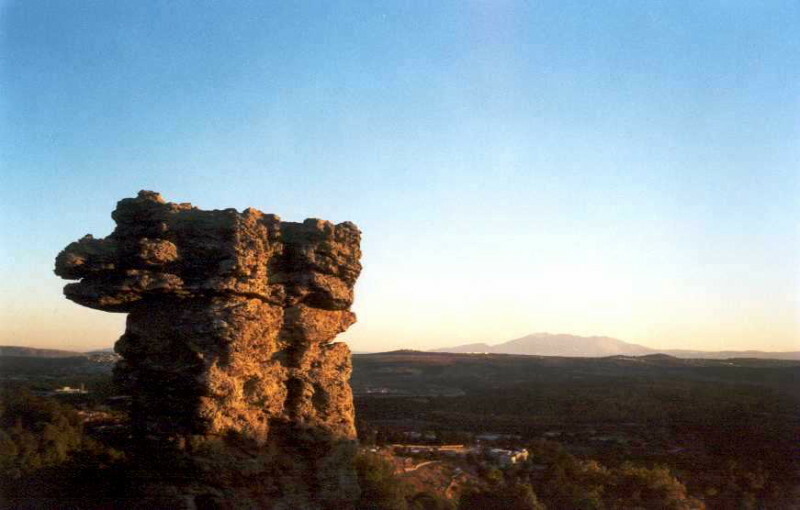 Kazakhstan, like Turkey, has a portion of its territory in Europe, the part West of the Ural river. That part is rather flat, I agree, but there must be a high point somewhere. I can’t imagine the authors not being aware of Kazakhstan’s geography, and have the impression they (literally) cut a corner there. The miss is even bigger considering that for the sake of completeness “Europe’s high points” also lists mount Ararat, the highest point of all of Turkey. 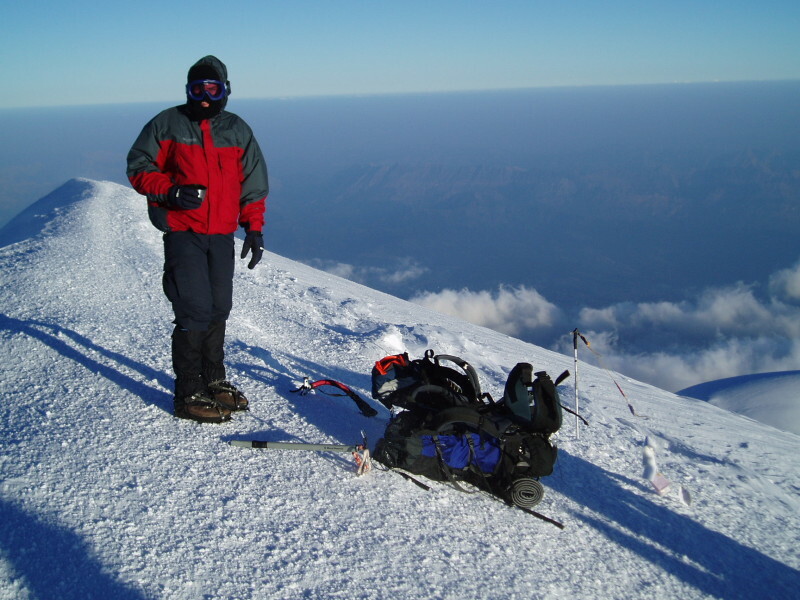 Including Khan Tengri, the 7010 meters high highest point of Kazakhstan (called “undoubtedly one of the most beautiful peaks in the world” at SummitPost.com) would surely add an extra edge to the book. Further, the highest points of the Azores and Canary Islands, that lie outside of geographical Europe are included in the “disputed” section. The reason is that the highest points of Portugal and Spain are actually on these islands, and not on the mainland. If the book will be updated, the highest point of Saba will have to be included. Saba is, since the dissolution of the Netherlands Antilles in 2010, officially a part of The Netherlands. Its highest point, Mount Scenery, is 887 meters high and almost 3 times higher than the previous high point of Vaalserberg (aka Drielandenpunt). Last but not least, I was delighted to read that “Europe’s high points” lists the high marks of England, Wales, Scotland and Northern Ireland separately. The listing is more due to the Britocentrism of the authors and less due to them sharing my UEFA-membership definition, but its always a pleasure to get an independent confirmation of one’s views. They even provided an entry for Faroe Islands (another UEFA member that I count as a “country”) in the “disputed” section. Djeravica, Kosovo’s high point, was deemed worthy a fully separate entry, despite Kosovo’s debatable status, but I’ll let that one pass. Ben Nevis – did I iron on the highest point in Scotland, or the UK? I’m glad to have “Europe’s high points” in my possession and I’m sure I will have a great time reading it and following the routes it describes. My adventures around Europe’s high (and low) points will continue being posted here, so stay tuned! And if you have a tale of an adventure on one of the peaks, disputed or not, I’ll be happy to publish it here as a guest post. – What is the purpose of your visit to Ireland? – How long are you planning to stay in Ireland? – As short as possible. – Where are you going to stay in Ireland? – Do you have sufficient means for the duration of your stay in Ireland? – Welcome to Ireland sir, have a nice stay. I knew right then and there that I loved Ireland. Every word of what I said was true, and the guy didn’t even blink. Maybe he was used to Ryanair tricks. But the whole 12 hours we spent in Ireland were marked by such conversations, so I guess its just Irish nature. Like the conversation with the guy who approached us right after we went out of the terminal. He was obviously just off the plane, like us. Looking a bit confused, he asked us where he can find the pubs. He asked us where he can find the pubs. In Dublin, Ireland. I couldn’t quite find the words. There are some 10 000 pubs in Ireland, and some 1000 in Dublin alone. That’s one pub per 500 people. The answer to “where can I find a pub in Dublin, Ireland” is, of course, “everywhere”. Trying to be polite, I suggested that taking the bus downtown would be a good first step. At least, that’s what we were going to do – get to town, find a hostel and go to a pub. As we were getting into the bus, the conductor was a bit startled to see us carrying an ironing board. – To iron, of course. – No, we’re actually on our way to Scotland. 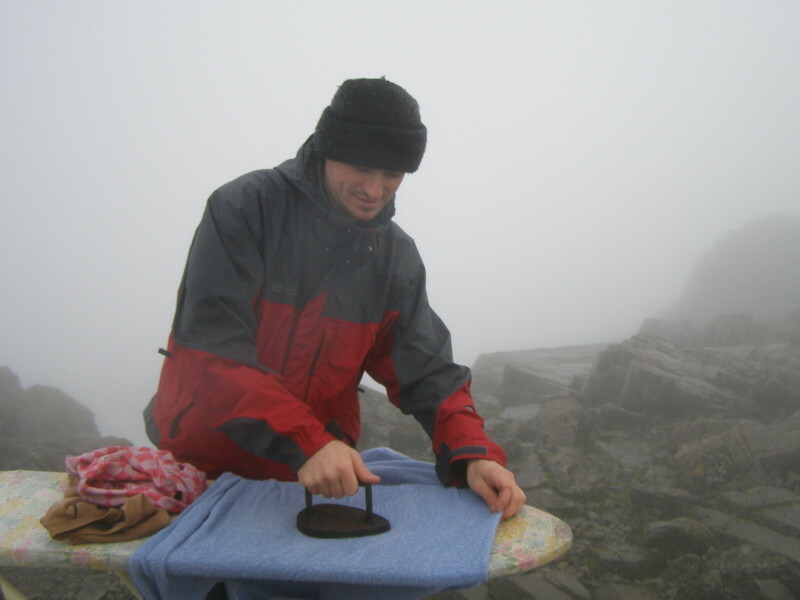 We’re going to do extreme ironing on the top of the Ben Nevis. – That’s just marvellous, marvellous! Welcome aboard! At that point, the pub-seeker boarded the bus, asking the conductor the same question – “where can I find the pubs?” To which he, unsurprisingly, got the same reply – “downtown, mate”. As the guy was making his way upstairs (it was a double-decker, of course), the conductor turned to us and said in an Irish accent I won’t try to reproduce and with the sadness of many years of experience: “where do they keep coming from?” We couldn’t agree more. The whole way to town he’d look at our ironing board from time to time and repeat “marvellous, marvellous”. We were appreciated in Ireland, that’s for sure. Finding a hostel was not very difficult, especially since our demands were simple – all we wanted were two free bunks. After a simple meal, we sat in the TV lounge for a beer before going out. A few locals were watching football, and asked us where we were from. Dave, the Dutch guy, they let pass. But me, the Israeli, one of them enquired with a grave face as to when are we going to have some peace done down there. Now I am an open-minded person and I am ready to learn from those who can teach me. But having an Irishman teach me about conflict management? That was just not going to happen. – And what would it take to have peace in Ireland? – Well, they should take a lot of those really big bulldozers, and dig huge ditches between all the 6 counties. – That’s exactly what we’re trying to do down there, mate. His friends roared with laughter and that was the end of the political discussion for that evening. It was time for us to find a pub. Fortunately, it was not a difficult task in Dublin. I have no idea where we ended up, but it was one of the best nights out I ever had. It was just one of the many pubs in town, but there was live music, good beer, a jolly crowd and a talkative barman. The band consisted of a guitar, a violin, an accordion and a bagpipe. We weren’t prepared for a bagpipe on a random night out, but it was awesome. Somehow, in Dublin, it makes perfect sense to have a violin and a bagpipe to be played in a pub. We weren’t staying long though as we had to get up at 6 (again) to finally catch the flight to Scotland. This is Part II of the story about the most awesome weekend trip I ever had. Next week – Part III – finally, Scotland. You know how everybody who’s been to Europe call their travel “epic” and “awesome” and “unique”? Well, they all lie. At least, most of them. 99% of the people who had a “unique” European experience were on a Contiki tour following the footsteps of millions of people, their journey was “epic” only if you count the epic amount of time they spent on a bus and if you use “awesome” to describe how you had a couple of beers in Amsterdam and saw the Red Light District then you’re probably from Milwaukee and that is, indeed, the most awesome thing you’ve ever done. I, on the other hand, have had my share of epic journeys, have done really awesome things and have had experiences that are truly unique. You doubt it? Well, let me tell you a story about the most awesome weekend trip I ever had – about that time when me and Dave went on an epic journey to Scotland, to do a unique thing – extreme ironing on the top of the Ben Nevis, the highest mountain in the British Isles. Even though European countries are small, I try not to squeeze too many in one trip when I travel. Too much of a good thing is also bad. But this time I visited 3 countries in a single weekend and had a great time. First we had to find a flight within our student budget. Ryanair was flying to Glasgow from Belgium for a bargain price, so it was worth the extra train travel. Or so we thought. We bought our plane tickets, I got the train tickets from Delft to Brussels and on the day of our flight we arrived at Brussels Airport well ahead of the departure. We had to get up at 5 to catch our train and were very proud of ourselves for being able to rise at such non-student hours. We had, however, a small problem – we couldn’t find our flight. None of the departure boards showed it. Actually, no Ryanair flights were shown. When we tried to find the Ryanair stand to ask their staff about what happened to their planes, we couldn’t find that either. Staff of other companies was rather surprised to hear us enquiring about Ryanair flights. “Ryanair? They don’t fly from here at all! Their flights depart from Charleroi!” I got us to the wrong airport. A quick evaluation of our situation showed us we were screwed. The flight was leaving in about two hours. By train it would take more than that just to get there and the check-in was closing 45 minutes before departure. The two airports are about 70 km apart and in normal traffic it would take less than an hour. But this was the morning rush hour and we were in the most congested part of Belgium. With the clock ticking, we’ve decided to try our luck and stepped into a taxi. We’ve explained our situation to the driver and immediately wished we haven’t. Seen the movie “Taxi”? Well, this was “Taxi” in real life. The guy was driving like he had saved the game and had 3 lives left. He employed every trick in the book, cut every imaginable corner, driving through gas stations, off and on the highway and what not. He got us there in 45 minutes through endless traffic jams. My hair started turning grey that day. By the end of the ride I was happy to pay the 140 Euros this taxi drive had cost us. I was happy just to be alive. We finally arrived at the right airport, alive and with 15 minutes to spare. Not that being there in time did us any good, because we weren’t flying just yet. Charleroi Airport was covered in dense fog, and none of the flights was leaving. After waiting for a couple of hours in the company of a group of elderly Scots (in kilts, at 10 AM already drunk and singing obscene songs), we were given several choices – stay in Brussels and fly the next day, go to Paris or Dusseldorf (at our own expense, of course) and fly from there or wait a few hours, fly to Dublin and fly from Dublin to Glasgow the next morning. Why Dublin I don’t know, but I’ve given up following the logic of air travel a long time ago and Ryanair’s logic is in a class of its own. We chose Dublin. At the very least it would keep us moving, without extra costs. Another couple of hours later we were at the check-in again. Dave, being Dutch, had no problems clearing the EU customs. With me it was a different story. I really don’t blame the Belgian customs. Sometimes, I get confused myself. I mean, I was an Israeli born in Soviet Union, living in the Netherlands, going from Belgium to Scotland but actually boarding a plane to Ireland. With an ironing board. Can you follow it? Neither could they. No wonder it took them the best part of 2 hours to let me through. They checked my passport, my residence permit and asked whether I had any other documents. I said “sure” and with a smile handed over my driving licence. My Dutch-issued driving licence. This really blew their mind. They said they had to look into it in and invited me to wait in a small separate room. Every customs officer on duty that day took a look at my papers, then they took them all somewhere else. I think they had to show them all the way up to the king before taking the brave decision to let the Irish deal with this mess. This is Part I of the story about the most awesome weekend trip I ever had. Next week – Part II – Ireland. Of the bite-sized regions I’ve divided Europe into, the British Isles are seemingly the least diverse. Just two coutries (UK and Ireland), one language (supposedly, English) and a uniformly depressing climate don’t appear too varied. But appearances can be deceiving. The countries of the British Isles may have only two embassies, but they do possess 5 national football teams, and national pride runs high, especially among the Scottish. Not to mention Northern Ireland. While everyone on the Isles speaks English, there are countless variations of it, to great frustration of the tourist who thinks he or she has mastered the language of Shakespeare yet can’t understand a word that’s being said. And oh, the climate. While some of the wettest locations in Europe are in the highlands of Scotland, London actually gets less rain than Rome. Let’s just say the climate adds variety to the British life. Never a dull moment – that’s the motto of the local weather. Hitchiking with an ironing board? No problem! “If we don’t know where YOU are, it makes it harder for us to help” – that’s understatement for you! Dave at Ben Nevis, top of the world! Americans and Australians favour the Isles as they offer a “soft landing” – culturally and linguistically speaking. The harsh reality is that the differences turn out to be rather noticeable, as this blogger found out. But experiencing these differences has a charm of its own. Plus there’s really a lot to see and do here. Like top-notch surfing sites in Ireland, superb hiking in Scotland, some of the world’s best beaches in Wales and, of course, London. To me, the greatest attraction of the British Isles is not the history, not the culture, not the drinking or the football, although all of these are generously offered. I go here for laughs. Seriously, this is the most humorous corner of the globe I’ve ever been to. This is where Monty Python, Rowan Atkinson, Douglas Adams, Lewis Carroll and many more come from. And it shows – the locals appreciate a good joke and are always prepared with one of their own. 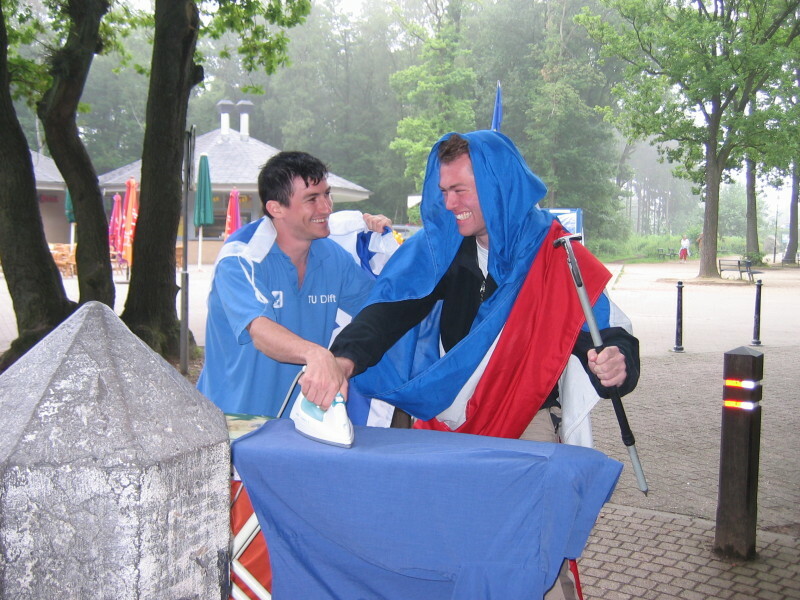 I occasionally do extreme ironing. In Belgium I was ignored, in Switzerland I was mocked, but here people genuinely appreciated me coming with an ironing board, and cheered me up all the way to the top of Ben Nevis. July and August are the warmest, but May and June are the driest, so make your bet. Be warned though – London has seen summer temperatures over 35 degrees in the last few years and the tube is really no fun in such weather. British Railways are not famous for comfort, precision or speed, and the highways are rather congested. Plus fuel prices are ridiculously high (as pretty much everywhere in Europe), so driving 1000 miles to the Highlands may be pricey. Fortunately, this is where budget airlines have been invented, and all the major cities are well connected. Fly, but remember to read the fine print! Some have difficulties distinguishing the British summer from the winter. Not the place to go to if you’re looking for weather guarantees. Stick to London. Hell, you can spend a year in this city and not ever be bored! Crossing the border in Europe is not what it once was. I remember an occasion from my student days, when we went on an geological field trip to Belgium. The bus was cruising on the highway as the professor announced: “Welcome to Belgium!” My fellow students, freshly arrived from African and Asian countries, were stunned. Where are the guards, the barbed wire? The prof had a hard time explaining that border controls are pretty much non-existent in modern day Europe, and that you just drive across without customs checks or passport stamps. The guys just couldn’t believe him, so on the way back they were hanging out the windows to catch a glimpse of the blue sign with Europe’s stars marking the border. Part of the fun in living in a place with so many small countries, is experiencing the rapid changes as you cross the border. Nut just the car number plates change. The language, architecture, landscape, all can change dramatically even if you travel between apparently similar countries. You can see these sometimes subtle changes in just a few hours. Let me show you what I mean. As there are so many borders so close by, hopping countries is really easy. 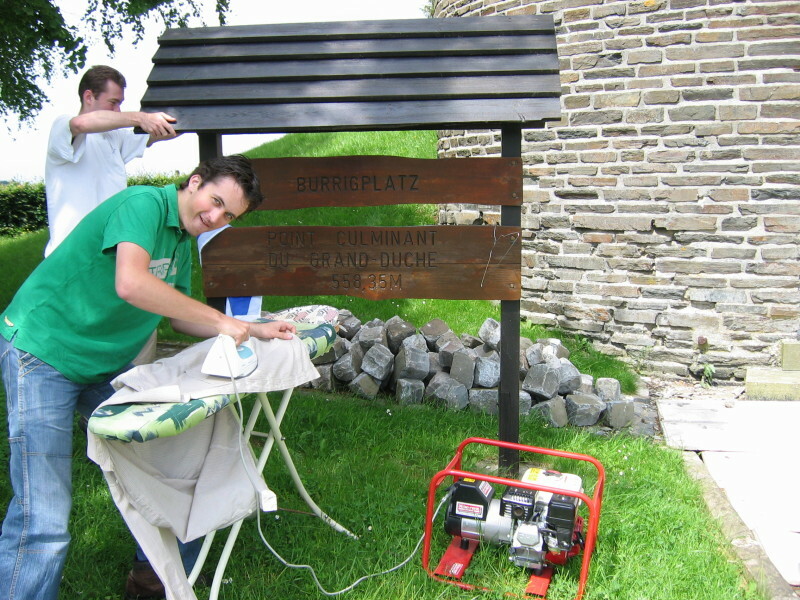 One summer day, we’ve decided to do something no one has ever done before (as far as we know) – Extereme Ironing on the highest points of all three BeNeLux countries. We hired a car and a portable generator, packed an ironing board and an iron and were on our way. All three tops are similar in being car-accessible, non-challenging locations. But the atmosphere couldn’t be more different. The Vaalserberg in the Netherlands is a major tourist attraction where hordes of people stand simultaneously in 3 countries. There’s a huge lookout tower, multiple restaurants and even a postal office. In Belgium, the setting is not quite similar. The highest point, actually a plateau, is tucked away behind a greasy roadside restaurant with a small garbage dump in the back. The added stairway to nowhere illustrates perfectly the absurdist nature of Belgium. The highest point of Luxembourg, on a pastoral countryside hill besides a castle-like water tower is characteristic for the fairy-tale character of that country. The whole feat took us some 8 hours including hiring the generator and driving there and back. However, some things have changed since that summer. Apparently, the highest point of Luxembourg is not the 558.8m high Buergplaz, but nearby Kneiff at 559.8m, a whole meter higher. Also, the island of Saba has become a part of the Netherlands after the dissolution of the Netherlands Antilles. The Dutch now have a proper mountain, Mount Scenery (877 meters), albeit rather far away from the mainland. We will wait until the Belgians rebuild the stairway, adding a couple of meters, or, even better, decide to demolish this abomination, and retake this historic journey. Saba, here we come!